Being an imperfect human being is so frustrating sometimes! We take the time to work on ourselves and strive to be better and then we go and fall back into old habits and make the same mistakes we have been making for years even though we have been trying so hard to change. “When a [favorite] plant became root bound and began to deteriorate, a young friend of ours decided to transplant it to a larger container. Carefully he lifted the greenery from its small pot and put it into its larger home, trying to disturb the roots and soil as little as possible. The novice gardener watched and waited. To his dismay, the plant still struggled. Our friend expressed his frustration to an experienced gardener who offered his services. When the plant was placed in the gardener’s hands, he turned the pot upside down, pulled out the plant, shook the soil from the roots, and clipped and pulled all the stragglers from the root system. Replacing the plant into the pot, he vigorously pushed the soil tightly around the plant. Soon the plant took on new life and grew. How often in life do we set our own roots into the soil of life and become root bound? We may treat ourselves too gently and defy anyone to disturb the soil or trim back our root system. Under these conditions we too must struggle to make progress. Oh, change is hard! Change can be rough…. C. S. Lewis indicated there is often pain in change when he wrote of God’s expectations for His children: “Imagine yourself as a living house. God comes in to rebuild that house. At first, perhaps, you can understand what He is doing. He is getting the drains right and stopping the leaks in the roof and so on: you knew those jobs needed doing and so you are not surprised. But presently he starts knocking the house about in a way that hurts abominably and does not seem to make sense. What on earth is He up to? The explanation is that He is building quite a different house from the one you thought of—throwing out a new wing here, putting on an extra floor there, running up towers, making courtyards. You thought you were going to be made into a decent little cottage: but He is building a palace” (C. S. Lewis, Mere Christianity, New York: MacMillan Co., 1960, p. 160)…. First, we must understand the need for change. An unexamined life is not worth living…. 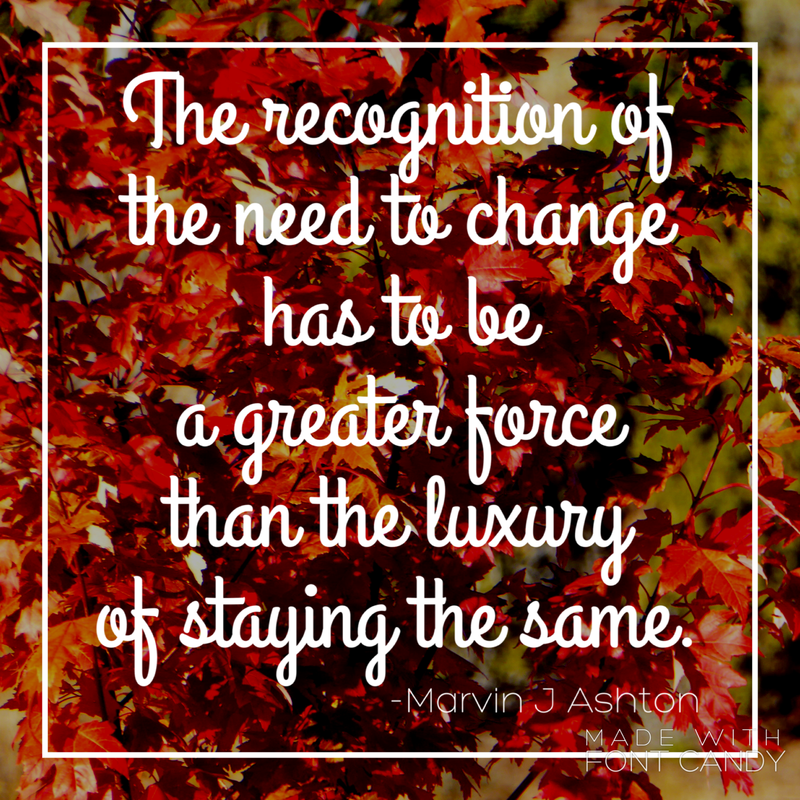 The recognition of the need to change has to be a greater force than the luxury of staying the same. Second, the facts must be authentic. We need to know how, what, where, and why to change. The gospel of Jesus Christ can help us set short-term, intermediate, and long-term goals by teaching us who we are, where we came from, why we are here, and where we are going. With this knowledge, a person will have greater strength to improve. Third, a system for change must be established. It was Emerson who said, A man who sits “on the cushion of advantages, goes to sleep. When he is pushed, tormented, defeated, he has been put on his wits, … [learns] moderation and real skill” (“Compensation,” The Complete Writings of Ralph Waldo Emerson, New York: Wm. H. Wise & Co., 1929, p. 161). Our change must be planned and orderly. After our system for change is established, it must be followed through to completion, even though it may disturb our very root system. Fourth, we must be totally committed to our plan for change. A Chinese proverb says, “Great souls have wills; feeble souls have only wishes.” Unless we have the will to improve, all the other steps to change will be wasted. This last step separates the winners from the losers. To read his entire talk (I highly recommend it) CLICK HERE. I believe the key reason we fall back into old ways and continue to make mistakes is because we lack a plan. I know this is why I am failing at many of my goals, because I haven’t formed a true plan on how I want to accomplish them. So what is that they say about a goal that is not written down? That it is simply a dream! 1. Determine why we need to change. 2. Write down how we plan to change. 3. Move forward with the plan, even if it causes us to change more than our original plan. 4. Find things that give you the will to keep going when the going gets hard! I need to change my thinking because it is not helpful or conducive to my main goal of a peaceful and happy home. I also want my family to notice the good around us, how will they learn to do that if I only notice the bad. My plan to change: When I start to entertain a negative thought I actively look for a way to twist it into a positive thought. Somedays I find that I start to justify my negative thoughts, this is when I ask myself the question is better to be “right” or to have a peaceful, happy home? Then hopefully I remember the best answer and keep trying to see the positive things. What are you currently trying to change about yourself? Remember the first step is recognizing a need for change!